What’s more challenging in the life of a woman: being a teenager … or being the mother of a teenager? Just yesterday she was a sweet-tempered, smiling little girl who thought Mommy was a saint and a genius, beautiful, beneficent, and all-knowing. Now Mom is an enemy, a barrier—or at the very least the font of all things embarrassing and uncool. And the erstwhile Miss Sweet Pea is … a werewolf? Who is this new headstrong, mercurial, mascara-wand-waving girl? 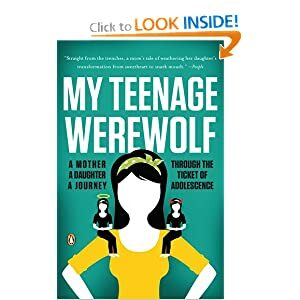 In My Teenage Werewolf: A Mother, a Daughter, a Journey Through the Thicket of Adolescence award-winning author Lauren Kessler embeds herself in her about-to-be teenage daughter’s life and shares her story with the eye of a reporter, the curiosity of an anthropologist and the open—sometimes wounded—heart of a mother. What I loved about this book was the open and honest dialogue that is shared about the good and bad times as well as the experiences that go with these. The book provides an open-access account to the author's life and experience (much like I have seen in previous writing from the author herself). I still have a few years till the teenage years, but I do have a seven year old that acts like a teenager and if this is any indication of what I have in store, I only can say that I am in trouble. There was so much humor intermingled with great insights that I have to say that any parent with daughters should keep this on their to read list for the future! If you do read this though, please know that you may have some surprises in store and you will have to keep this in mind to hold on for a fun ride!